In my family tradition pal kozhukattai is done to celebrate the baby's first tooth. 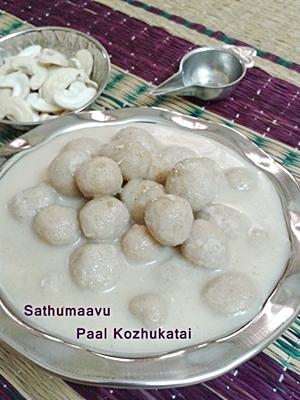 It is named as paalu kozhukattai. It's made with rice flour. In this recipe I added Sathu maavu / Multi-grain health mix to make it more healthier. 1. 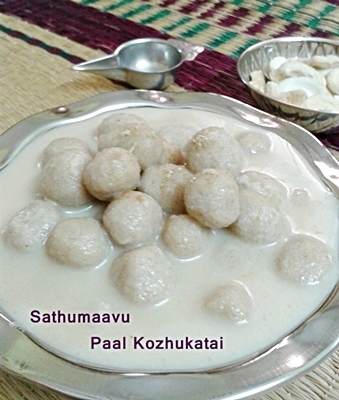 In a mixing bowl add all the ingredients for making kozhukattai (water, milk, salt, rice flour / idiyappam flour and sathu maavu) and mix well to prevent lumps. 2. Then transfer this mixture to a non-stick pan and add ghee. Heat this mixture over a medium flame, keep stirring until it forms a dough consistency. Turn off the stove. 3. When its cools down a little, knead it to a form a smooth dough. Make small balls out of it approximately the size of a country gooseberry. 1. In a sauce pan add jaggery and water just sufficient to cover the jaggery. Bring it to a boil, when the jaggery is completely dissolved, turn off the stove, cool and filter it. Keep aside. 2. Heat milk and water in a pan, when it starts to boil add the balls and simmer it. 3. The balls will first sink to the bottom of the pan and once its cooked, it will raise up. Then add coconut milk and stir gently. Then add jaggery syrup and stir. Allow to simmer for 5 minutes. 4. Garnish it with grated coconut and cardamom powder. Cashew nuts roasted in ghee can also be used for garnish.